Francine awakens to a nightmare. 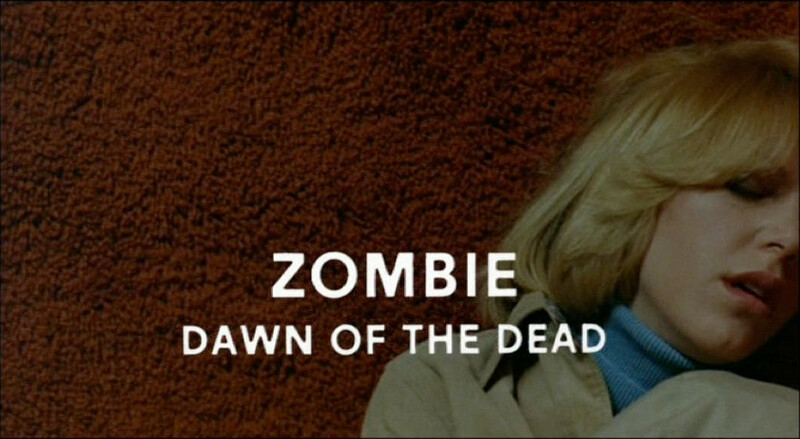 George A. Romero emerged from the legal disputes over the rights to Night of the Living Dead being allowed to make sequels but unable to use the phrase “Living Dead” in titles. That must have been especially galling, as it had been an oversight during renaming for distribution that had stripped the film of its copyright. When Romero decided at last to make a sequel, he struck a deal with his friend Dario Argento. Romero would write and direct the movie, and Argento would raise the funding in exchange for the overseas distribution. 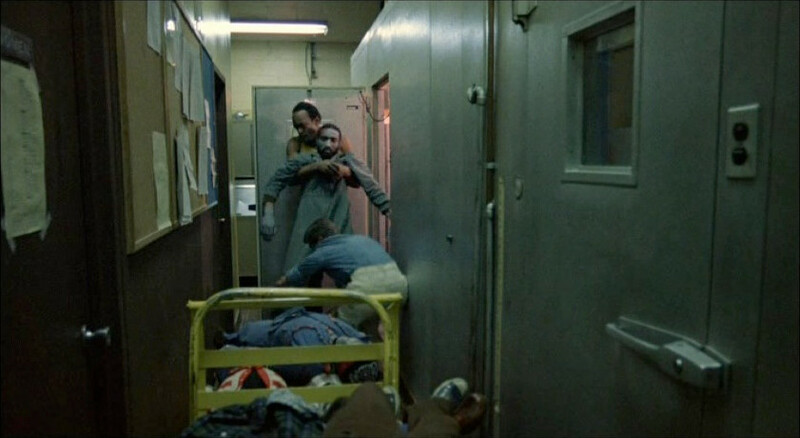 In America, the movie was released as Dawn of the Dead . Argento re-edited the film and released it as Zombi . 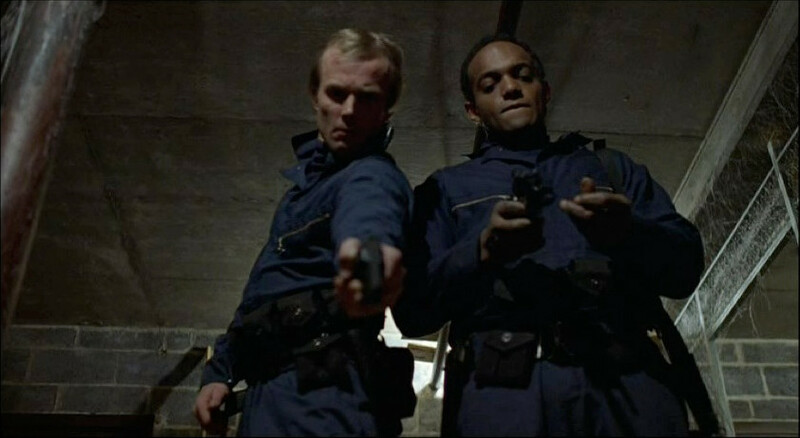 Dawn of the Dead has long been my favorite of the Romero zombie films. Filmed mostly in the Monroeville Mall, it serves as a commentary on the mall culture of the following decade. Observing that the dead are drawn to the location, Stephen (David Emge) remarks “This was an important place in their lives”. Some of the best scenes in any zombie film are the shots of the dead going about their business in the mall: riding escalators, looking in windows, strolling, and of course falling down. Since I wasn’t yet a teen when this came out, it would be a decade before I saw any cut of it. In the meantime malls became the center of my life, where I’d hang out with friends and paw through cut-out LPs. Comics and novels I read were postulating a future where we’d all live in malls. So by the time I saw a TV edit of Dawn of the Dead the suggestion by Peter (Ken Foree) that they live at the mall seemed like an obvious choice. Even the convenient presence of the Volkswagen hatchback made sense to me as car dealers regularly had stock on display at our local mall. Peter and Roger clear out the basement of the tenement. The core players are all pretty great, and I like the dynamic between the characters. There’s believable friction at first between the escape’s organizer Stephen and Peter, who’d arrived unexpectedly with Roger (Scott H. Reiniger). Nobody really knew Peter — Roger had only met him that night during a disastrous police raid — and he had strong opinions about civilians mishandling firearms. It looks like another fatal personality clash, like Ben and Harry in the farmhouse; but with access to plentiful supplies and defensible shelter, tempers recede and cooperation becomes the order of the day. It’s a lovely change up from the tone of the previous film, without underplaying the hazards of dissension in dangerous situations. It’s easy to get along when the stakes are low, but when lives are on the line you’ll wish you’d established genuine teamwork. Peter instructs Stephen on the finer points of gun safety. Francine (Gaylen Ross) is the film’s anchor. In some ways she’s a clumsy trope — the woman whose pregnancy represents hope for the future — but Ross’s performance elevates her to full personhood. Apparently at the actress’s insistence, Francine is an active participant in clearing and defending the mall. She learns as many skills as she can from the others so that she can help if they have to evacuate. No wonder she’s irritated as the men discuss whether she should terminate her pregnancy. Not as though that shouldn’t be offensive to begin with, but Francine proves time and again that she’s operating at full capacity. It’s a far cry from the hysterical heroine of Night of the Living Dead , and I hold that the biggest single misstep of Zack Snyder’s Dawn of the Dead (2004) is reducing pregnancy to a gruesome joke. Francine listens to the men discuss her pregnancy. I’ve been using the American title so far, because my comments apply to both the U.S. theatrical cut and the European cut Zombi . I would expect that they also fit the Cannes cut and the dozens of regional edits that confuse any discussion of the movie. Now I’ll be specifically addressing Zombi (Argento cut), especially in contrast to the American (Romero) cut. Peter and Stephen put the corpses in freezers. I confess that I was skeptical going into my first viewing of Zombi . Would it be akin to watching the neutered version of Argento’s Susperia , still beautiful but unsatisfying? As it started I kept alert to any possible change, but within moments I was swept up in Francine’s fight to have her network’s list of emergency shelters actually be accurate. It’s the sort of systemic breakdown that’s Romero’s bread and butter, and the conflict between timeliness and accuracy carries swiftly to the tenement raid, turning a search for a criminal into a killing field. Although life in the mall provides a brief respite from tension, Argento keeps the pace crisp and the anxiety high. I’m not actually a big fan of Goblin, but swapping out much of the music library soundtrack for synths was a good call here. The raiders mug a zombie. For the most part I noticed not the absence of scenes but the more serious tone. It turns out that much of the removed footage was the overtly comedic material, although that wailing you hear is the lamentation chorus of gore hounds for the loss of the scene where a zombie’s head is sliced by the helicopter blades. It’s a neat effect, but the movie still plays without it. Similarly, Argento trades shots of zombies killing cops for more of the zombies being killed by Roger and Peter. I think it’s a fair exchange, as it strengthens the bond between the two as well as their mutual disgust with civilization. We all have our favorite zombies. Mine’s the one that steals Roger’s assault rifle. The largest difference for me was the finale, so skip to the end if you don’t want to know how it plays out. The raiders in the Romero version essentially serve only to let the zombies back in to the mall; they rush in, fire a few shots, and get wiped out by the undead mall-walkers. Argento re-edited the climax to make the raiders more important. The zombies still get in — and ultimately prevail — but the humans only lose by overstaying. Leaving men outside and having a select crew providing cover, a quick looting run seems feasible. What ruins the mall for all of the living is that Stephen and Peter get embroiled in a shootout with the raiders. The end result is the same, but it plays out as a much grimmer human conflict rather than the inevitable result of materialism. The collapse of the merchandise oasis is chaotic and terrifying, with nary a chuckle in sight. 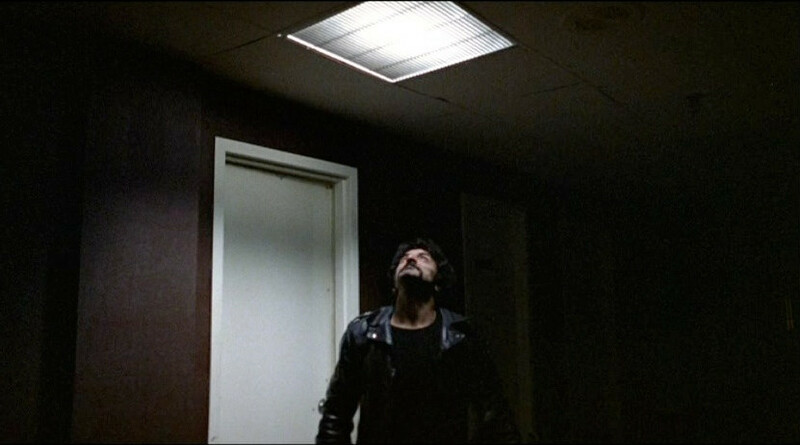 A raider (Tom Savini) sees Peter’s escape route. I found the Zombi cut to be well worth seeing. A few great moments are lost, but the overall experience is quite a thrill ride. It’s a great movie in its own right; not better or worse than Dawn of the Dead , just different. After watching this I poked around online to see if there was a comprehensive list of the differences. What I found was vitriol the likes of which are usually reserved for child molesters. Venomous screeds called for Argento’s death for ruining a classic film. Fan, you’ll recall, is short for ‘fanatic’ — a word that connotes excessiveness and fervor. My own heart may be dark and shriveled, but it’s got room enough for both versions of this terrific movie. The existence of one version does not destroy the other. It’s all still out there, awaiting our consumption.